Concept: Create a hashtag photo and video sweepstakes to capture and highlight the busy morning moments and celebrate the women who are running on dry shampoo and coffee. Objectives: Showcase Dove Hair and Dunkin’ joining forces, create a deeper relationship and lasting impression with fans of both brands. Real life is often messy, chaotic, and never as picture perfect as Instagram would have you believe. The spirit of showing what is “real” has been a driving mission and spirit behind Unilever-owned Dove for over 60 years, and they continue to listen and show what real women are doing and saying. Their latest digital campaign is no different, only this time they are tackling the reality of what morning really looks like for many women. Dove Hair and Dunkin' have joined forces to celebrate women who are running on dry shampoo and coffee. Because let’s face it, it’s rare that mornings are filled with acai bowls and carefully curated lattes. Everyone is looking for those ultimate life hacks to get them going in the morning and out the door. Nothing helps you to save time and stay ready for the unexpected moments that the day may bring like coffee and dry shampoo. 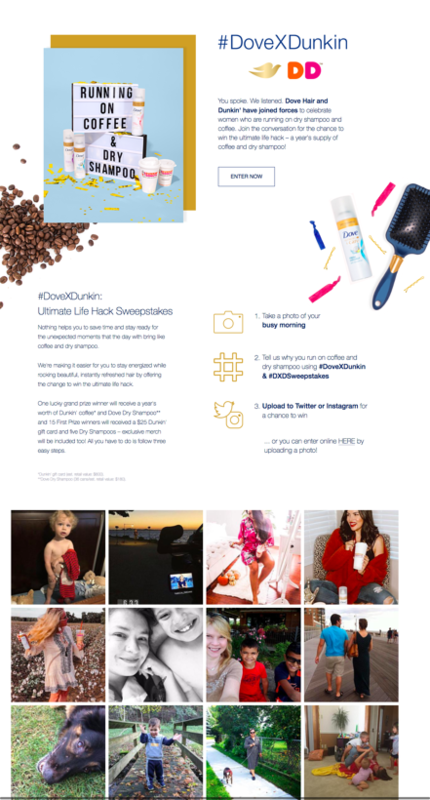 Dove and Dunkin’ is asking their fans to join the conversation for the chance to win the ultimate life hack – a year's supply of coffee and dry shampoo! All fans have to do is upload a photo or video with a caption about why they run on coffee and dry shampoo using #DoveXDunkin & #DXDSweepstakes for the chance to win. For fans that may not be on Instagram or Twitter, they have also wisely added a direct upload on their campaign landing page HERE, so everyone can participate. Dove’s and Dunkin’ DCI score will be a combination of an Engagement Score (ES) and Virality Score (VS). Their campaign is built around joining an already active conversation around life hacks and creating visibility for Dove and Dunkin' in this social interactions. Check out more details below on best practices you can incorporate into your digital campaigns to increase Engagement and Virality, as well as drive in-store purchases using online channels. Take advantage of improved tech features. Dove Hair and Dunkin’ took advantage of the Wyng Platform to enable consumers to easily submit to the contest via Instagram and Twitter, but also submit seamlessly from their campaign website. The approach enabled them to design a unique experience with functionality that allowed anyone to participate, whether they had social profiles or not. Have a clear call to action. It’s important to provide clear, specific guidance on how to participate in the campaign. In this case, “submit a photo of your busy morning”, aids in reducing confusion that might prevent consumers from participating. This is a simple, yet effective way to optimize consumer engagement. Include a hashtag for sharing. A simple way to increase sharing is to enable entry submission using a campaign hashtag on social. Not only did the Dove Hair and Dunkin’ team allow consumers to directly upload their photos, they also encouraged submissions by sharing to Twitter or Instagram using the campaign hashtag #DovexDunkin. Leverage Instagram’s popularity. Instagram’s popularity has been on a steady increase since it first launched in 2010. With roughly 1 billion active monthly users as of June 2018, Instagram is one of the most popular social media networks worldwide. Brands looking to harness consumer excitement, drive social sharing, and maybe spark their own viral moment should leverage Instagram’s popularity and high rate of sharing and engagement to give their campaign’s a boost. You can view the submissions for Dove and Dunkin’ video and photo sweepstakes here.